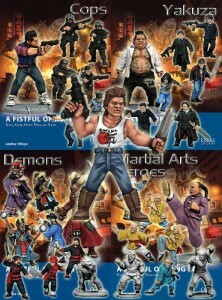 North Star Military Figures is taking down names of those of you gamers out there who want their Fistful of Kung Fu minis, including a special one-off model for those that pre-order. Place your favorite "Big Trouble in Little China" quotes in the comments. We always like to offer you a deal on our new Osprey Rulebook- Figure Range tie in. This deal gets you one rulebook, one each of the four different Kung Fu squad box sets and a special one-off figure, made just for the deal. The one-off figure is of a truck driver trapped in Little China, picture to follow soon. As an extra bonus, if you order before January 1st 2014, the order will be sent post free World-wide.